We’ve all heard the saying “No pain, no gain,” but not all pain is created equal. Many motivated gym goers have been put out of commission because they couldn’t tell the difference between post-training soreness and a serious injury. “Many people don’t pay attention to their body, and as a result the pain can last the rest of their life,” says Evan Ekman, a South Carolina-based orthopedic surgeon and Gold’s Gym Fitness Institute member. He believes much of the problem stems from not being in tune to the location of the discomfort. “Part of an effective workout is making yourself sore, but that soreness should be in the muscle belly — the big bulky part of the muscle,” he says, whereas pain in the joints or tendons might be an indication of a problem. Here we look at six examples of gym pain gone too far and what to do about them. As always, consult your physician before starting an exercise regimen. Your legs can easily tire after a hard workout, but how do you know when you’ve pushed your hamstrings too far? According to Ekman, you may be dealing with a more serious injury if you experience pain when pressure is put on the ischium bone in the pelvis, often felt when you sit down or if you have difficulty running. First, control inflammation by applying ice to the area and wrapping the leg. Then gently perform a hamstring stretch: Sit on the floor, with legs spread. Keep your left knee straight as you reach toward the toes and hold for 30 seconds. Repeat on the right side. If you recognize the pain early, a hamstring injury might keep you out of the gym for a few weeks or less. Some body creaks we all seem to have (like the back cracks your eccentric uncle shows off at parties). Others may be your body’s way of sounding an alarm. Ekman says there are two ways to tell if it’s something to get worried about: if you experience pain when it makes that noise, or if your body didn’t make that noise before you worked out and now it does. Because the noise could be anything, get to a doctor for a proper diagnosis. 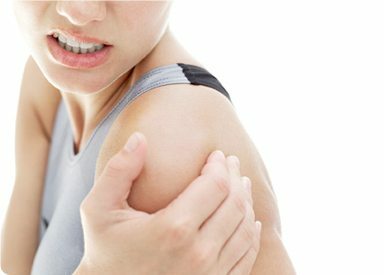 It’s normal for the biceps to engorge with blood and, as a result, appear bigger during and immediately after a workout, but if the swelling lasts more than a few hours, you may have suffered a bicep strain or rupture of the tendon biceps. Another telltale sign of injury is discoloration or bruising. If you can’t tell for sure, don’t do another rep until you get checked out. A rupture may require surgery — get to a doctor ASAP. If it’s just a strain, you’ll need some time off from the gym to rest the muscle, taking anti-inflammatories in the meantime. The next step is light exercises that develop your range of motion. Begin with gentle stretching at the elbow, work your way up to bicep curls with band resistance, then finally light dumbbells. Bench press is a popular lift at the gym, but using too much weight or trying for a maximum one-rep lift before being properly warmed up can lead to pectoral tears. “Most of the time it’s easy to tell when you have a pec tear because the pain is intense,” Ekman says. But you can also tell by a deformity — often a divot on the side of the pec near the armpit — or extreme tenderness that doesn’t go away between workouts. Immediately see an orthopedic doctor — this could mean a long haul to recovery. If you’re having trouble reaching during your workout, it may not be time to work through the pain; it may be a rotator cuff injury. Other signs are tenderness during a military press or when lifting weight away from your body. Avoid lifts that involve raising your hands above your head and shoulders, and work to strengthen the four muscles of the rotator cuff — the supraspinatus, the infraspinatus, teres minor and the subscapularis. Often this is done through external and internal rotation exercise. For the first, let your arm hang at your side with your elbow bent 90 degrees, then bring the hand across your body, as if you were shutting a door. For the latter, bring the hand in the opposite direction, away from the middle of your body. Though it’s great to feel the burn on the squat machine, persistent aches — such as shooting pain, a slight burn or anything that limits daily movement or makes it painful to walk — may be a sign of a stress fracture to the femur, a rupture or even a contusion in the quads. Another warning sign of injury: deformity, or any change in shape and texture to the muscle so that one leg is noticeably different from the other. If it’s a strain, you may be out for four to six weeks while taking anti-inflammatories, icing and performing basic stretching and strengthening exercises. If it’s a rupture, surgery is likely to be needed.